In the most basic sense, MCT oil is simply a type of fat otherwise known as medium chain triglycerides. MCT oils are named that way because it describes the length of the fat and the number of carbons in the "fat chain". Taking it one step further there are actually multiple types of fat that meet this criterion and are therefore considered to be "medium" in length so long as they have less than 10 carbons in their chain. What's important to know here is that the length and the number of carbons have special implications on how the body treats and metabolizes these fats. If MCT oil is just a supplement that provides your body with fat directly how can it possibly lead to weight loss? Many people try to blame the obesity epidemic on the over-consumption of fat in general (the eating fat leads to weight gain hypothesis) but is this actually the case? There is compelling evidence that suggests it has more to do with the TYPE of fat you consume rather than just the consumption of fatty foods in general. This can be perfectly explained with supplements such as MCT oil (1) or CLA which both have scientific studies showing they can and do help with weight loss. So why do some fats tend to help the body burn fat mass and others cause weight gain? Much of this is felt to do with how the body actually metabolizes and breaks down these fats once they are consumed. Due to their length, medium chain triglycerides are rapidly absorbed into the blood-stream from the intestinal tract. Longer chain fatty acids have to be broken down before absorption to increase surface area and then placed in chylomicrons for proper transport in the bloodstream which is mainly a water-based compound. Think of what happens when you put olive oil directly in water. The water and the oil separate and form clumps. Obviously, this wouldn't be healthy for the body so your body breaks down the fats and transports them by attaching them to certain molecules. 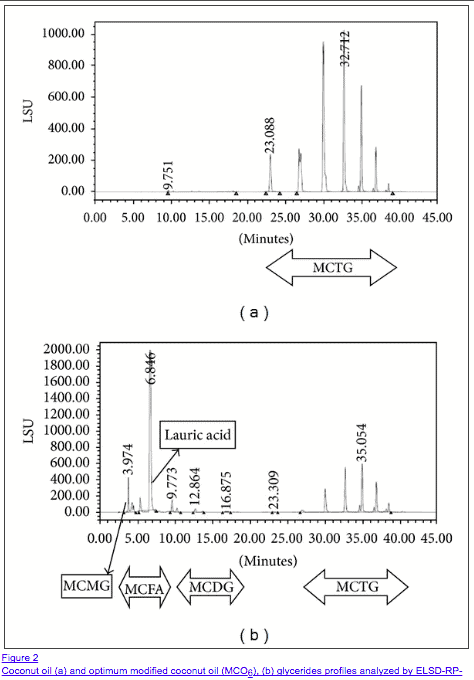 But some fats are small enough (MCT oils) that they don't need this special mechanism. So these fats are rapidly absorbed and then transported directly to the liver where they function as a rapidly available source of energy for the body. Because more of these fats enter the liver and are oxidized (burned for fuel), the longer chain fatty acids tend to be stored as fat rather than burned for energy directly. Hopefully, this is making sense! Studies have even indicated that consumption of MCT oils causes an increase in thermogenesis (body temperature) and an increase in fat oxidation when compared to LCT (long-chain triacylglycerols). This is important because the more energy that your body produces, the more heat it produces and the more calories it burns at rest. Because of these special properties, MCT oil can be used to augment fat burning and even help with weight loss (but more on that below). We jumped into discussing MCT oil and how it works before we really talked about how you get it. So how do you get MCT oil? From foods? From supplements? The truth is you can get MCT oil from all of these sources but the concentration and quality vary dramatically. Medium chain triglycerides are a component of the fats found in certain foods such as coconut oil, certain dairy products, and palm kern oil. Does that mean that using coconut oil will give you the same results as taking an MCT oil supplement? The MCT oil in coconut oil is only PART of the total fats, but not the main component. Coconut oil only contains about 14% MCT's by weight, palm kern oil has about 7.2% and butter has about 9.2% (2) (defined as MCT's less than 10 carbons). That means coconut oil contains some of the longer chain fatty acids as well as the medium-sized fats (in fact over 50% of the fats in coconut oil would not be classified as medium chain triglycerides). Using MCT oil supplements allow you to super concentrate specific chains of fatty acids without also consuming the longer chains. There is a difference in how your body metabolizes these fats and it's potentially more beneficial to consume only certain lengths of fats. 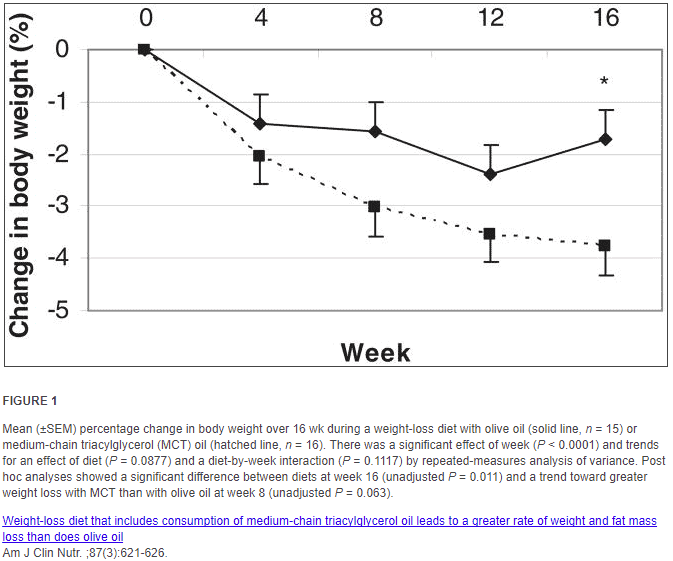 And studies do suggest (3) that there is a difference in results if you use a longer chain healthy fat (such as olive oil) versus medium chain fats such as MCT oil. This is why supplementation with MCT oil is preferred over food sources of healthy fats like coconut oil. Do MCT oils help in other areas? It turns out that these fats can help in a variety of ways which we will discuss below. Many people use MCT oils to help increase results by combining them with certain diets such as the ketogenic diet while other people use them to augment concentration and boost creativity. One of the main reasons that people want to use MCT oil is due to its effects on weight loss and metabolism. 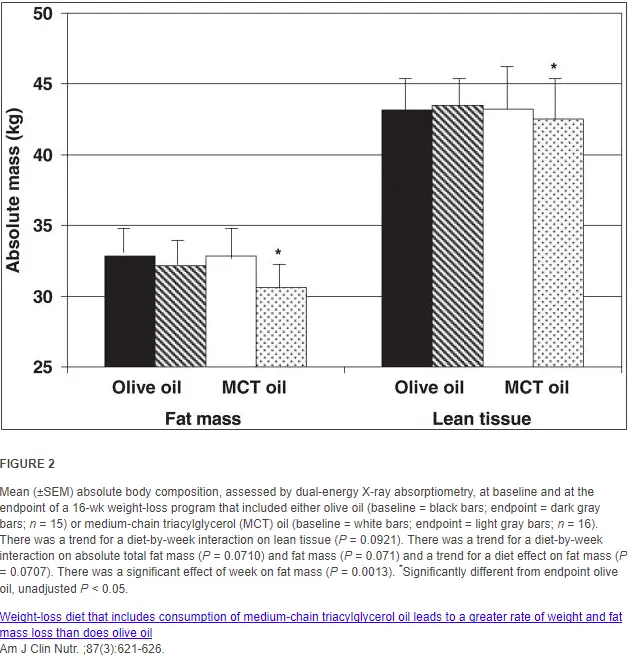 MCT oil has been shown in several studies so augment weight loss, especially when combined with diet and exercise. The mechanism by which it works is similar to other fats such as CLA. MCT oil increases fat burning directly by increasing fat oxidation in the liver and other tissues. Oxidation is a catabolic process by which fatty acids (the substances that your fat cells are made of) are broken down into energy or ATP in the mitochondria of your cells. This is a complicated biochemical process which is regulated at many steps and MCT oil seems to augment this reaction naturally. MCT oil has been shown to help curb appetite and increase satiety. Macromolecules (carbohydrates, proteins, and fats) all tend to manipulate satiety sensors in the brain a little bit differently. Consuming a large number of carbohydrates (especially refined sugars) will keep you full only for a few hours. Compare this to consuming fats or proteins which keep you feeling full or satiated for much longer. 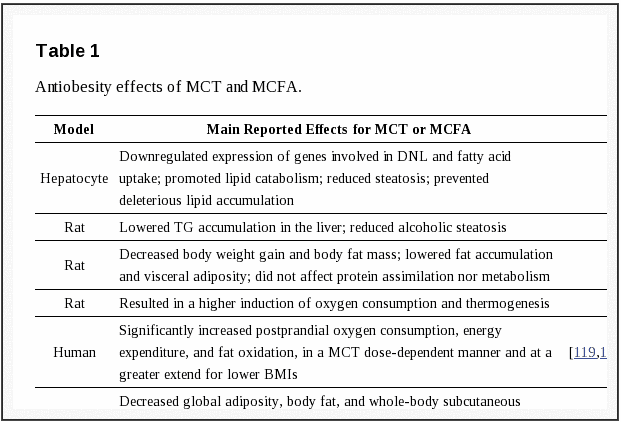 Because MCT oil is a fat, it tends to have this effect on most people. Is the weight loss benefit associated with MCT oil significant? The weight loss associated with daily MCT oil use is modest, but not incredibly significant unless paired with other weight loss therapies. 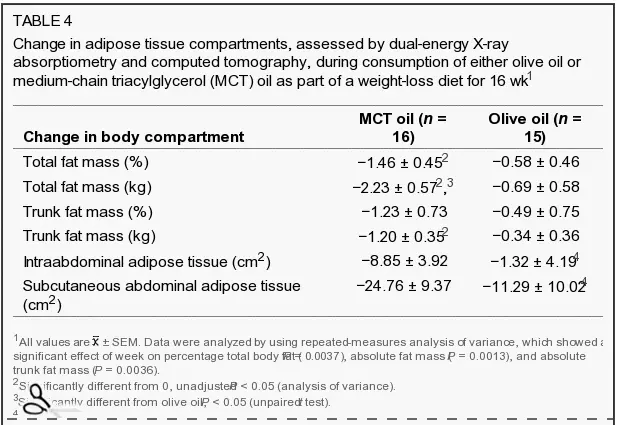 Various studies (4) do show that daily use of MCT oil results in a reduction in body weight, waist circumference, hip circumference, total body fat, total subcutaneous body fat, and even visceral fat. 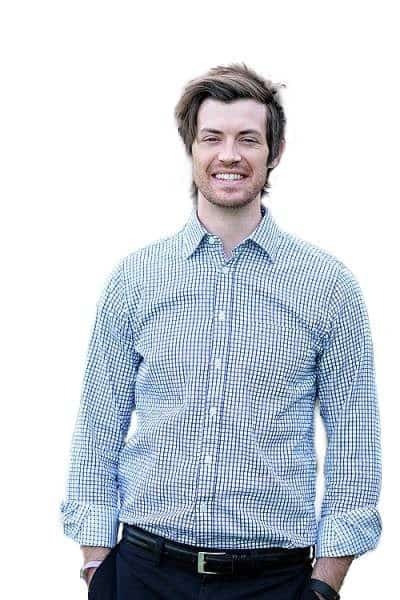 The high end of weight loss achieved is somewhere between 2-3kg or about 4-6 pounds (5) if used daily. While this may not seem like a significant amount it can be increased when added to healthy eating and daily exercise. MCT oil is often paired or used in conjunction with the ketogenic diet. The ketogenic diet is a diet incredibly high in fats which helps shift the metabolic metabolism of the body away from glucose and into fatty acids which produces the characteristic ketone bodies. This change in metabolic metabolism brings with it a number of benefits including weight loss, enhanced focus and potentially an improvement in metabolic and cardiovascular markers. MCT oil is used with this diet because it is more ketogenic than long-chain triglyceride alternatives. By consuming MCT oil with the ketogenic diet people can consume more carbohydrates and protein-rich foods (6) which may make the diet more palatable for some. This is especially useful if you are using (or planning to use) the ketogenic diet in children for conditions such as epilepsy (7). Adherence to the classic ketogenic diet can be difficult which can be made easier with the addition of MCT oil. In addition, the use of MCT oil may reduce the time it takes to enter ketosis during these diets and reduce some of the negative symptoms that are often associated with a transition into this diet. Another popular reason for using MCT oil is to benefit from the increase in mental clarity, focus and cognition often associated with its use. The combination of coffee plus MCT oil is quite effective for increasing productivity and creativity. You've probably felt something similar when you have caffeine. Occasionally, after consumption of caffeine or other stimulants, your mind enters a zone where you have amazing clarity and heightened function. While there aren't studies that discuss this benefit there are studies that show medium chain triglycerides may be therapeutic in cases of Alzheimer's disease. The brain predominantly uses sugar or glucose as an energy source but it can also use ketones, monocarboxylic acid and lactate (8). Because medium chain triglycerides are rapidly absorbed and metabolized into ketones they may provide the brain with an alternative source of energy that may account for these effects. The entire process is not well understood and not everyone appears to get these benefits with daily use, but it is still beneficial to those who do! The use of medium chain triglycerides may also promote a healthy gut and healthy intestinal microflora. "Gut health" is a general term used to describe the overall health and environment of your intestinal tract. It has reference to the permeability of your tight junctions, the type, and concentration of bacterial species living in your gut and your ability to absorb and assimilate macromolecules and nutrients, the consistency of your bowel movements and much more. Basically, a "healthy gut" is one that doesn't have any intestinal issues - that means no gas, bloating, constipation, diarrhea, nutrient deficiencies, abdominal pain, IBS, IBD, reflux, SIBO, etc. And we know that having a "healthy gut" is very important for overall health. So how does MCT oil fit in here? MCT oil has been tested in various animal models and has been shown to have very favorable effects on intestinal permeability and intestinal microflora concentrations (9). What this means in simple terms is that it helps kill off bad bacteria, promote the growth of good bacteria while helping to treat leaky gut (or increased intestinal permeability). If you decide to use MCT oil after reading about the benefits there are a few things you should know first. While MCT oil is a fat and you can cook with it, it's often better and more convenient to use it simply as an additive or supplement to things you are already consuming. Many people do this by adding 1-2 tablespoons of MCT oil to their morning smoothie or by adding the same amount to their morning cup of coffee. If you don't drink coffee or have a smoothie in the morning you can also add it to a hot cup of herbal tea. Because MCT oil is often flavorless (or has very little flavor) it can easily be added or infused in salad dressings. I recommend caution if using this approach because traditional salad dressings can already be high in fat, so it's best to use homemade salad dressing if you choose this route. Lastly MCT oil can be used as an oil substitute while cooking. Just be careful not to use it if you are cooking at temperatures higher than 320 degrees which is the smoke point for MCT oil. At higher temperatures, the fat may oxidize and cause issues if consumed. For those who have never used MCT oil before you will want to start out with a lower dose and slowly titrate up (or increase) your dose over time. Starting out with 1/2 to 1 tablespoon per day is usually sufficient and very well tolerated. You can stay at 1 tablespoon for 1-2 weeks before attempting to increase up to 2 tablespoons per day which is the ideal dose. Most of the benefits of MCT oil will be realized at this 2 tablespoon dosage (including weight loss, cognition, gut health, etc.). For weight loss and appetite suppression, you will want to start out with a supplement like this one. This oil has a blend of Caprylic acid (C8:0) 4,800mg, Capric acid (C10:0) 3,900mg and Lauric acid (C12:0) 4,000mg. The C followed by the number indicates the number of carbon atoms attached to eat of the compounds above. The smaller the carbon atoms (Caprylic acid and Capric acid) the easier it is for your body to absorb and metabolize the fat. Lauric acid with its 12 carbons is not necessarily in the same "class" as the other smaller carbon fats and therefore not as effective. 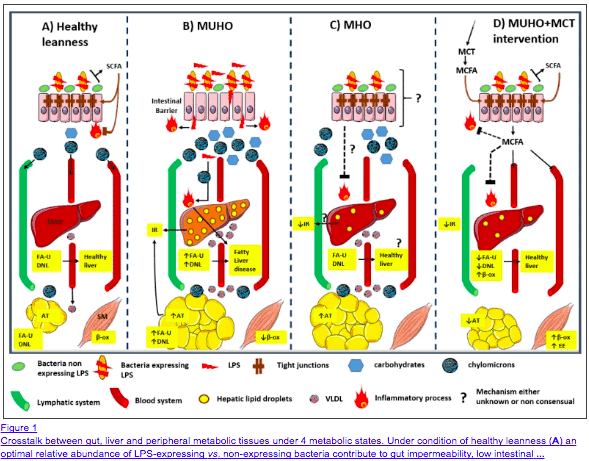 What this tells us is that we want an MCT supplement that supersaturates the 8 carbon and 10 carbon chain triglycerides over the 12 carbon triglycerides. Basically, the higher the concentration of 8 carbon and 10 carbon fats the more effective the supplement will be. This is why some "MCT oils" are so cheap. They are basically coconut oil with the label of "MCT". To get true MCT oil you want your supplement to have a much higher concentration of Caprylic acid and capric acid when compared to lauric acid. The supplement linked above contains about 38% caprylic acid, about 31% capric acid and about 31% lauric acid. This breakdown is much more favorable than just coconut oil by itself which makes this supplement a good starter MCT oil for most people. You can find a more "pure" MCT oil by using a supplement such as this one which contains 100% C8 or caprylic acid. For those counting that makes this supplement about 13x stronger than coconut oil and about 3x stronger than the MCT oil listed above. For those serious about weight loss, energy, cognition, and performance you may find superior results in using a more potent MCT oil which contains only 8 carbon and 10 carbon fatty acids. When using this supplement you may need to start at a lower dose as some people are more prone to developing headaches if they titrate up their dose too quickly. MCT oil should ALWAYS be used in conjunction with a healthy diet, daily exercise, supplements, and hormone management (if necessary) if your primary goal is weight loss. Don't expect amazing results if you don't put in the effort! Is it safe to jump into using MCT oil? Absolutely and provided you follow some basic guidelines. First is to start low and go slow. Most of the side effects of MCT oil come from using too much too quickly and these side effects can be mitigated easily by simply ramping up your dose slowly over time. With the exception of the changes to serum cholesterol concentrations, the other side effects tend to fade over time or completely go away if you titrate the dose slowly over time. One other pitfall worth mentioning is that you can use too much. 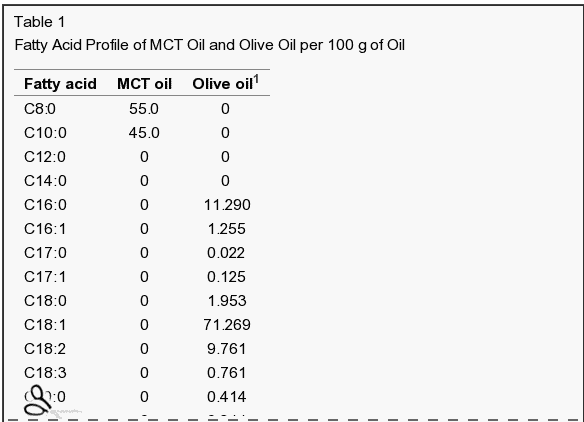 Because MCT oil is a source of fat it is also a source of calories. Don't use too much or you may inadvertently curb your weight loss efforts. This can be avoided by simply pairing MCT with a healthy diet and then you won't have this problem. Proper use of MCT oil can potentially help with weight loss, increase energy levels, improve your focus, improve cognition and normalize your gut health. Smaller fatty acids with carbon chains less than 10 are easily absorbed and rapidly metabolized by the body leading to many beneficial side effects. When supplementing make sure you look for medium chain triglycerides that are actually "medium" based on their carbon chain. That means finding supplements that contain a high percentage of Caprylic acid and Capric acid. Try to avoid products that contain high concentrations of lauric acid as these may just be coconut oil supplements disguised as "MCT oil". You can get some MCT from your diet but whole food sources of MCT such as coconut oil often contain only 10-15% of the fatty acids that provide the most benefit. Have you used MCT before?